James McGirk, “James McGirk,” Histories of the National Mall, accessed April 23, 2019, http://mallhistory.org/items/show/409. 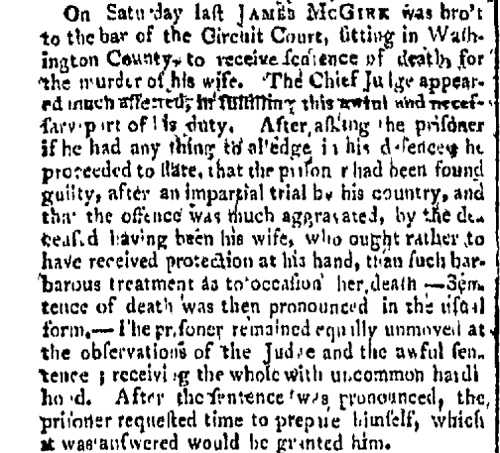 James McGirk was the first person to be executed in the District of Columbia on October 28, 1802. He was found guilty of murdering his wife. At this time, the gallows were located on the Capitol Grounds, between where the Grant and Garfield statues stand today. Washington Federalist. April 14, 1802. James McGirk, also spelled McGuirk, was a local bricklayer who lived on F Street, between 12th and 13th Streets. He was known to drink to excess and abuse his wife. In April of 1802, McGirk was convicted of having beaten his wife so severely it resulted in her death and the still birth of their child. His trial and sentence of death led to debates about the morality of capitol punishment in newspapers. Appeals to President Jefferson by McGirk and his lawyer for a stay of execution were unsuccessful. Upon his execution McGirk was remorseful, stating "When a man's character is gone his life is gone." He was hung on October 28, 1802. After the execution, the location for McGirk's burial was a point of contention. His body was buried and exhumed several times by people dissatisfied with such a notorious criminal being buried near their relatives.